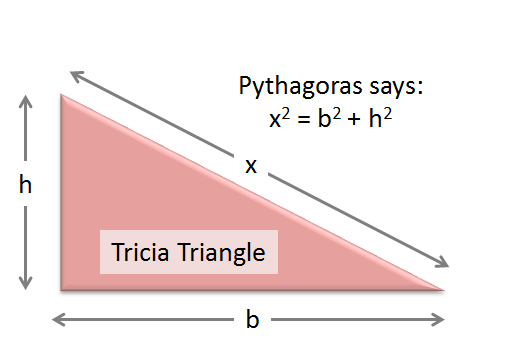 Last time I promised a blog about Pythagoras. That was a long time ago because I kept getting distracted by writing Pluralsight courses and – well – basically things that – unlike this blog – actually earn me money! But I really should honour my promises so… But first a warning: This is a serious blog post about an important mathematical topic. It’s definitely not a subject for humour, so this time, there are no jokes. Completely serious. But the curious thing is, I can’t recall ever questioning why it was true. For me, it’s always been one of those things that you accept, like the fact that the sun will rise tomorrow or that Microsoft will foul up every other Windows version. Which is strange really, because I’m supposedly a sciency-type person and sciency-type people like to know why something should be believed. I guess, if I ever thought about it in my youth, I probably just vaguely assumed that it could be proven but the proof would be far too long and boring to be worth reading. I was wrong. 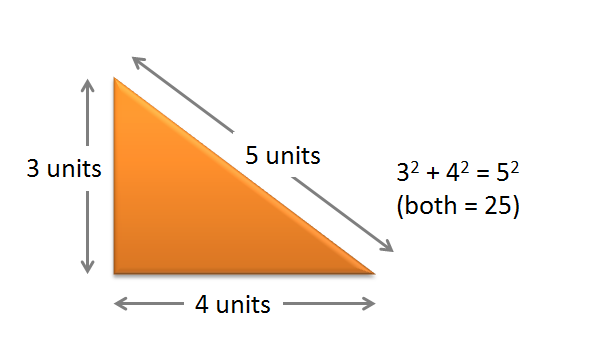 Proving Pythagoras is ridiculously simple. I discovered that last year when I was reading a book, The Great Mathematicians: Unravelling the Mysteries of the Universe. It had lots of stories about ancient mathematicians doing ancient mathematical things and then suddenly there was the page about this ancient Greek guy called Pythagoras and then there was this paragraph that basically proved Pythagoras’s theorem with a couple of easy diagrams. After I’d got over my shock, I started Googling – and discovered that this knowledge isn’t remotely esoteric. In fact, a simple Google search shows there are loads of very simple ways of proving Pythagoras’ Theorem using basic geometry, and multiple easily accessible websites devoted to showing off those various proofs. But I suffer from chronic Not-Invented-Here syndrome, so I just had to write my own proof. So we start with this Triangle, which I’ve called Tricia. We’ll use h to indicate Tricia’s height, and b to indicate the length of her base. We’ll call her hypotenuse (that’s the fancy name for her longest side) x. So what Pythagoras says, and what we want to prove, is that x2 must equal h2 + b2. 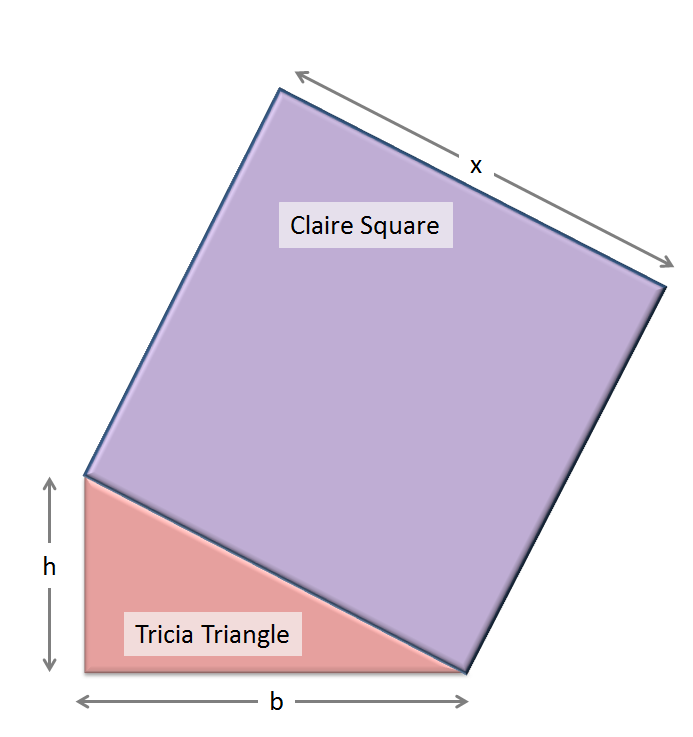 Now I’ll introduce Claire the square – a square of side equal to Tricia’s hypotenuse, x. I’ve drawn Claire lying on Tricia’s longest side. Next I’ll draw another triangle – I’ll call this one Armani. (Yeah. I had a lot of trouble thinking up names that blend onomatopoeically with ‘triangle’ and Armani was the best I could do). Armani is the same size and shape as Tricia, and also lies on Tricia’s side, like this: You can get Armani by rotating Tricia by 180 degrees about the point I’ve marked with a black circle. And finally, I’ll draw three copies of Armani. As you can see Armani gets under Claire’s skin a lot. 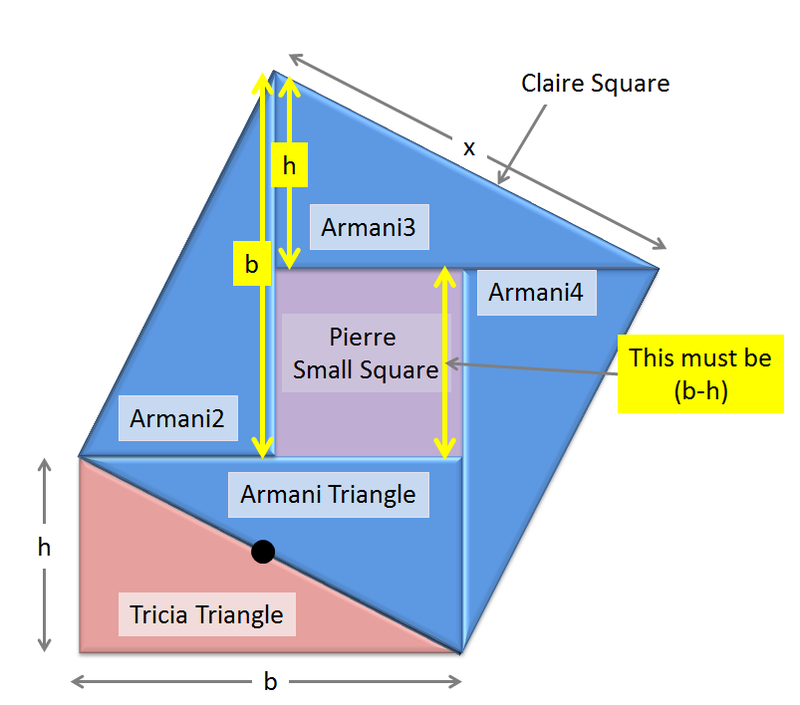 And you can also see that these four Armani’s leave a new smaller square – which I’ll call Pierre – right inside Claire. That’s the hard stuff done. The rest is just a simple bit of algebra. In this next diagram, I haven’t added any more figures, but I’ve taken some liberties with our new friends, and marked some more lengths around them, in yellow: Hopefully it’s obvious that the each of Pierre’s sides is of length b – h, which means Pierre has area (b-h)2. On the other hand, Claire’s area is x2 (because her sides are length x). Meanwhile, each Armani has area bh/2. 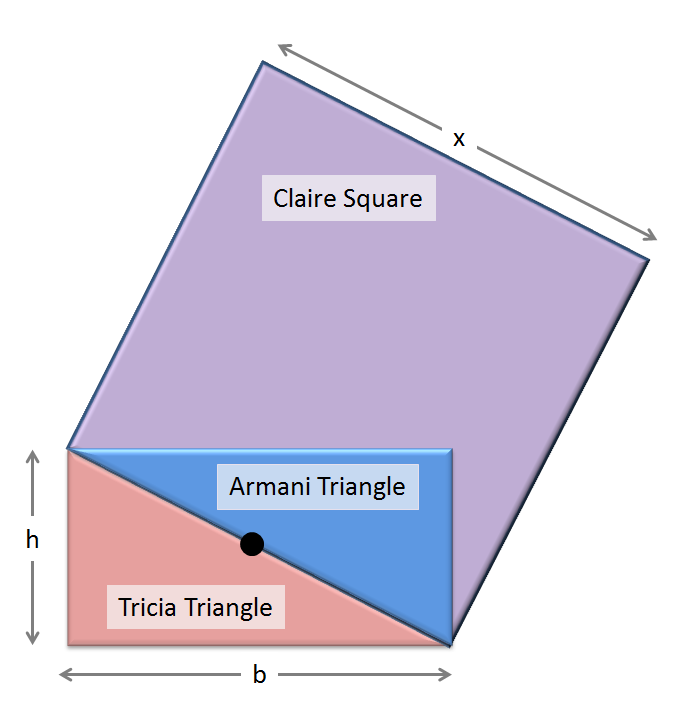 If you can’t see that, think that the original Armani and Tricia between them make up a rectangle with sides b and h, so together they have area bh. And since Armani and Tricia are both the same size and shape, they must each therefore be half of that. Or bh/2. 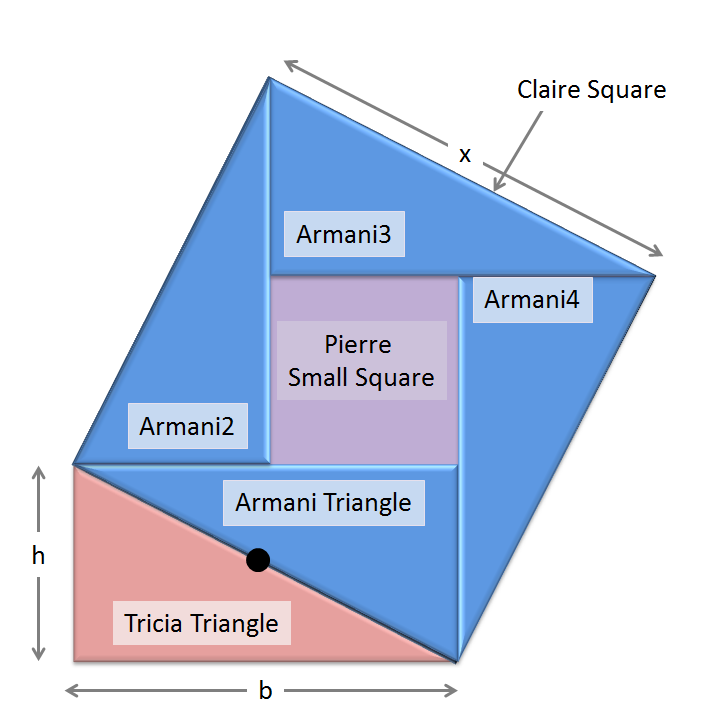 Area of Claire = Area of Pierre + 4*area of Armani. Or x2 = b2 + h2. Which is Pythagoras’ theorem proven. And I still can’t get over how easy that is. Next time… I present the simple geometrical proof of Fermat’s Last Theorem. Previous Post Dear computer: I INSPIRE YOU.